MPW Residential Window Cleaners offer an honest and reliable service that is delivered with a satisfaction guarantee. We do not charge for poor workmanship! Old values, modern technology, Health & Safety, mixed with good old fashioned customer service are what MPW Residential Window Cleaners is all about. We offer a range of access services for your property, including ladders, the reach and wash system and cherry pickers. So what solutions are right for your property? Ladders are suitable for residential window cleaning up to two stories (6-7 meters). All our ladder operators have been fully trained and tested to reduce the risk of accidents. The reach and wash system is a cost effective way of cleaning windows that are higher than 7 Meters. The telescopic lightweight water fed poles with the reach and wash system use purified water straight from the vehicle, which is not harmless to buildings, animals and plants. 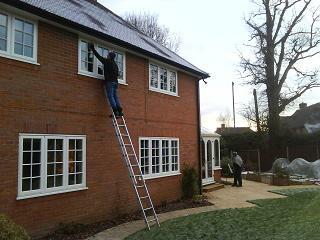 The system will clean all of your glass, window frames and sills. It is also a lot safer to use than a ladder because the fully trained operator uses the equipment with his feet firmly on the ground. The risk of damage to your property is greatly reduced as these poles are very light and easy to manoeuvre, unlike ladders which have a history of marking paintwork, cladding, breaking tiles, guttering and sometimes leaving unsightly holes in your lawn. Not to mention the risk dropping equipment or falling off! These poles also allow us to access so much more that ladders can, such as above your conservatory roof, over and above a protruding bay window, above single or double level pitched roofs, awkward access through some trees and giving us up to 17 metres in height. The Reach & Wash system is not perfect for every scenario, For example, it does not work very well on deeply recessed windows or very old (leaky) leaded lights. You have to be able to get the brush head all the way around the frame surrounding the window otherwise the muck usually from the top of the frame just drips down over your nice clean window. Cherry Pickers are only brought in when none of the options detailed above are suitable for your home. In all the years MPW Residential Window Cleaners has been operating we have only had to use cherry pickers on residential properties a hand full of times. UPVC White Work (fascias, soffits and cladding). Garage Doors and Front Doors. Removal of Wall Climbing Plants. Interior Glass (Interior Double Glazing, Mirrors, Interior Glass Doors). Builder Clean to remove Cement, Paint or other Building Debris. We provide a totally flexible service to suit your needs, such as frequency; maybe you live in a quiet area and only require a clean every 2 or 3 months, or you prefer the ground to be cleaned alternately to the top, maybe you live by a busy main road or railway and cleaning every 2 or 3 weeks. Maybe you need a phone call the day before to remind you to unbolt your gate so we can gain access all around your property; you might want an invoice, pay by BACS or direct debit. One thing is for sure, MPW residential Window Cleaners will find a way to solve your window cleaning needs. To get a FREE no obligation quotation for your home e-mail us or complete an enquiry form, or simply just give us a call on: See Home Page.